If you are looking for a bar and grill where you can jam out to live music and enjoy cocktails on an expansive patio, The Gaff is your local watering hole. 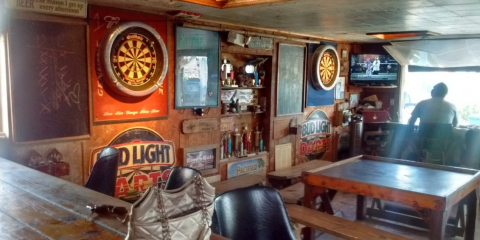 Located in Port Aransas, TX, this restaurant is the go-to place for many in the community thanks to their delicious food and quality service. This bar and grill has made a name for itself across the region for their home-cooked American cuisine and one-of-a-kind pizza. Not only does the delectable food and cold beer draw in the crowds, but the events they host are show stoppers. They present their customers with a number of events, including live music, belt sander races, and chicken bingo. The restaurant’s fun-filled spirit and live bands will ensure you have a great time with friends or family every time you visit. When you are looking to plan your next night out or its a spur of the moment decision, have an entertaining time and delicious meal at The Gaff. Call the restaurant today at (361) 749-5970 for more information or visit their website to view their menu. You can also like them on Facebook to receive updates on upcoming events.